On an uncharacteristically cold May afternoon in Munich, the Bundesliga season drew to a close and despite the nippy temperatures, Bayern Munich’s players followed up their routine 3-1 victory over Hannover by chasing each other around the pitch with oversized glasses of Weizenbier as they celebrated their fourth league championship in a row, and three in three under Pep Guardiola. About 600km to the north, another 3-1 home victory for the 2009 champions, VfL Wolfsburg, over the 2007 champions, VfB Stuttgart, confirmed that Stuttgart would be relegated to the second tier for only the second time in their history. Despite the home team taking all three points, there were no beer showers in the Volkswagen Arena. This game did little more than put two sets of fans out of their misery. Stuttgart went down, but Dieter Hecking’s Wolfsburg haven’t exactly had a season to write home about either. A rousing but ultimately irrelevant home win against Real Madrid in Champions League aside, last year’s runners-up have had an underwhelming and frankly shambolic campaign. People may point to the Kevin De Bruyne-shaped hole that Julian Draxler has failed to plug, but sliding down from second last season to eighth this time around – and finishing outside of the European places – takes some serious dereliction of duty from key players. Chiefly among them is the infuriating André Schürrle, who only seems able to turn it on for 15 minutes per match, Max Kruse, who is doing everything he can never to play for Germany again, and Dante, who Germany enjoyed walking past, through and over in Belo Horizonte in 2014. The industrious Maximilian Arnold is one of very few players to come out of the season with much credit. But what about the men who bring these players to the club and coach them? Sporting director Klaus Allofs and coach Dieter Hecking need to take a look at themselves. Granted, with this current Bayern team, and Borussia Dortmund again looking lethal under Thomas Tuchel, the top two places in the league are spoken for. Nevertheless, third-placed Bayer Leverkusen finished 28 points off the top and 18 behind Dortmund; Mönchengladbach couldn’t buy a win before changing manager; Schalke let their manager go at the end of a disappointing season; and, with all due respect, a club with Wolfsburg’s budget and squad should be finishing above Mainz and Hertha Berlin. People have been fired for much less and perhaps Hecking and Allofs are lucky that the club’s owners, Volkswagen, have been preoccupied with their own problems recently. From the Volkswagen Arena to the Mercedes-Benz-Arena, and from VfL to VfB – one motor city to the next. In recent weeks the dark clouds have been gathered over the Schwabenmetropole. First, VfB Stuttgart II, the reserve team, once the vanguard of nurturing the stars of tomorrow, were relegated to the fourth tier. Last weekend, they were duly followed into the murky depths of amateur football by the Stuttgarter Kickers, the city’s second team, where Jürgen Klinsmann began his career. And now the first team. Three teams, three relegations – an unwanted hat-trick. Of course, VfB Stuttgart’s collapse has caused the most uproar. No club has a divine right to be in the Bundesliga, but when a Traditionsverein is relegated it doesn’t go unnoticed – by fans or the media. The club’s first relegation in 41 years has looked more inevitable every week as each must-win game was limply contested and lost – the last three of the season with an aggregate score of 12–4. But who is to blame? If you ask the fans, it’s clear: pretty much everyone. In recent weeks, fans in the Canstatter Kurve and beyond have shouted themselves hoarse calling for a complete clear-out at board level. They stormed the pitch on the last day of the season to show the players what they thought of their efforts. But this is more than just painting names on bedsheets and wagging fingers at bemused millionaires in shorts. The fans have looked on for too long as their beloved club has lurched meekly towards second-tier football. Something had to happen and it has. In the hours following the relegation, heads started to roll. First team coach Jürgen Kramny was bumped backed down to reserve team coach and club president Bernd Wahler resigned from his post. The third person in the fans’ firing line, sporting director Robin Dutt, managed to hang on a few days before being told to clear his desk. While Kramny disappointed after an initial spike in results, he only took charge of first-team affairs midway through the season following the sacking of Alexander Zorniger in November last year. But for Dutt – who insisted on bringing Zorniger to the club from RB Leipzig – this is another in an increasing long line of failures. Dutt made his name with SC Freiburg, by taking them out of the second division as champions in his second season and establishing them in the top half of the Bundesliga. He was rewarded by Bayer Leverkusen, who appointed him to take over from Bayern Munich-bound Jupp Heynckes at at the start of the 2011-2012 season. However, he took a team that had finished second – and above Bayern Munich – to seventh and was dismissed after a run of five straight defeats that included a 7-1 battering from Barcelona. In the summer of that year, he joined the German football association as their new director of sport, with the job of developing youth talent and training coaches. It was an unusual post for someone who had failed to successfully step up to the next level in terms of club football. Nevertheless, within a year he was back in the saddle when he was given a second bite at a big club’s cherry. He took over at Werder Bremen – where again he only lasted a year, before leaving them at the foot of the table. Undeterred by Dutt’s growing stench of mediocrity, VfB appointed him sporting director at the start of 2015, when it appeared his main responsibilities were looking forlorn and a little angry in front of the camera after limp displays. It became hard not to associate his browbeaten look with failure. In simple terms, a sporting director has two main tasks: find a good trainer and give him decent players. Dutt’s desire to bring in Alexander Zorniger backfired, and although some of his transfers arguably worked out, his failure to identify and sign a quality central defender was almost criminal and played a major part in the team’s relegation: VfB conceded 75 goals this season, 10 more than anybody else in the league. Despite Dutt’s obvious shortcomings, not all of the blame can be laid at his door. His predecessor, Fredi Bobic, fared little better and, despite being a club legend, he was hounded out by supporters at the end of 2014. And Horst Heldt, who held the position from 2006 to 2010, also has his fingerprints all over the murder weapon – and arguably more so than Bobic and Dutt. Although he could do little to stop title-winning and homegrown players such as Mario Gómez and Sami Khedira leaving the club, Heldt failed to build on the Bundesliga victory, instead spending the club’s money poorly in the transfer market and overseeing numerous managerial changes. There have been 10 new men in the dugout since Armin Veh was let go 18 months after he won the league in 2007. And even though the 11th, Jos Luhukay, may be a promotion specialist, having navigated Borussia Mönchengladbach, Augsburg and Hertha Berlin through the treacherous waters of the 2. Bundesliga, it is by no means a given that he can steer Stuttgart back into the big time. He has his work cut out, starting with the players. The current crop not only reveals a lack of discernible leaders but a real dearth of quality. Although the club were unlucky with keeper Mitchell Langerak’s injuries since he was signed from Dortmund, there can be little excuse elsewhere. The spine of the team – Georg Niedermeier, Toni Sunjic, Christian Gentner, Martin Harnik – does not look out of place in the second division. Make no mistake, VfB Stuttgart cannot be accused of being too good to go down. Since winning the title in 2007, Stuttgart have been on a steady decline. Not only have they never looked like repeating the act, they have spent the last few seasons fighting to just stay in the league and only avoided relegation last season by two points. Their once-famed youth system and Spielkultur has gone – so too potential stars of the future, like Joshua Kimmich who was quickly snapped up by RB Leipzig after being allowed to leave the VfB youth set-up as a teenager. Kimmich, of course, ended this season as a key player in Pep Guardiola’s swan song in Munich. But what does the future hold? First things first, if you go on reputation alone, Stuttgart are an enormous fish in a small pond. The Mercedes-Benz Arena holds over 60,000 fans and is one of the best stadiums in the country. Although fans will look forward to rekindling their fierce rivalry with Karlsruher SC, they will not be looking forward to the shame of facing them in the second tier. And while they may have the chance to exchanging blows with one old sparring partners, others have leapfrogged them. SC Freiburg, for example, recently celebrated promotion back to the Bundesliga. This relegation is not just the result of 34 poorly contested football matches. It is the result of the best part of a decade of poor leadership and enough treading water to fill an Olympic-sized swimming pool. 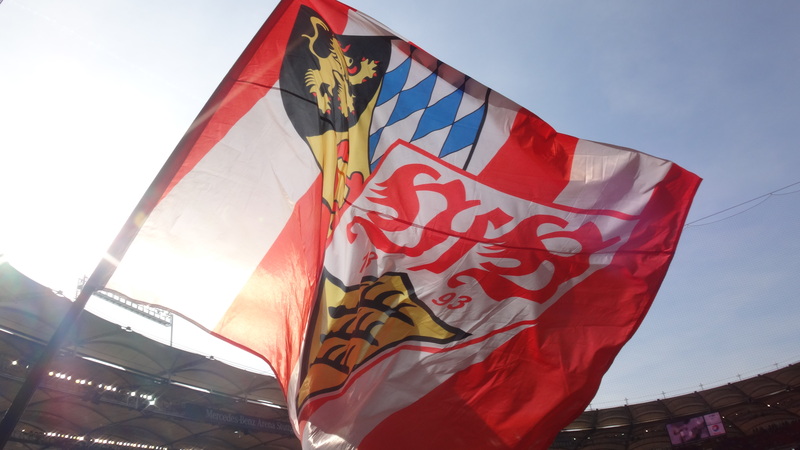 For the last four seasons, VfB have been looking over their shoulder, feeling the draught of the Bundesliga trapdoor and now finally, after driving their fans to drink, they were unable to find two teams who wanted it and deserved it less than they did. To some, it may come as a relief – just the tonic to stop the aching decay. The club are trying to stop the rot by cutting off the fish’s head and the 2 Bundesliga should be seen as a chance to revive a culture of winning games, to give the club’s younger or more talented players – such as Timo Baumgartl, Lukas Rupp, Filip Kostić, Timo Werner and Daniel Ginczek – a chance to regain confidence and flourish away from the toxic atmosphere of a relegation battle. But battle they must, for as many other teams will testify, once you drop out of the Bundesliga, getting back is far from easy. So while Munich’s players, staff and fans were sinking a few Weizenbier in celebration, followers of Wolfsburg and particularly Stuttgart may have been staring into the bottom of their glasses with very different emotions.